A focus group is a small group of people who are asked a series of questions about a product or service. The group may consist of a cross section of people from society or be made up specifically of potential customers. 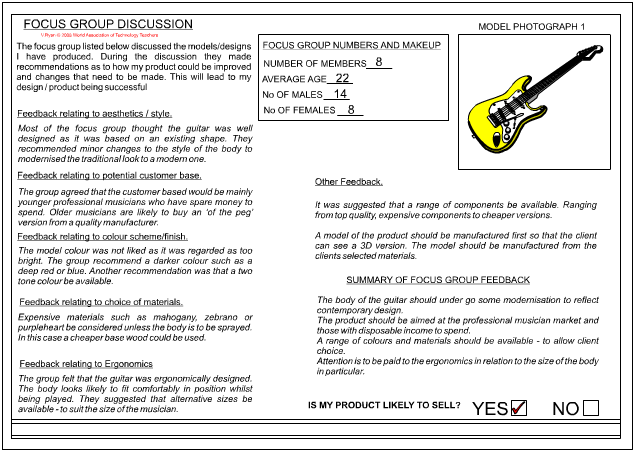 For instance, a guitar manufacturer may put together a focus group of musicians in order to ask them questions relating to a new guitar design. A bicycle manufacturer may have a focus group of bicycle shop owners in order to determine the type of bicycles likely to sell in the following year. The type of questions normally asked of a focus group relate to a design or design concept, an idea, advertising, product, price and even packaging. Using the skills and questioning power of a Focus Group is an essential marketing tool as it helps companies and businesses focus on what they need to do to make their product or service successful. During a focus group meeting questions are asked in a relaxed atmosphere where members of the groups are encouraged to express their opinion freely and openly. All opinions are listened to and regarded as valuable. They may suggest slight changes to the name of the product or slight alterations to any aspect of the design. They may help the designer / manufacturer target or identify potential customers. They will express their likes and dislikes regarding the product or aspects. They will say if the product will sell or if it is likely to be popular. A focus group is likely to suggest methods of advertising the product and which types of advertising are likely to be the most successful. By the end of a focus discussion the designer / manufacture will consider suggested changes to the design/ product and how it is to be advertised / promoted. If the designer / manufacture fails to consider points raised by the focus group the product will probably be a commercial failure. 1. 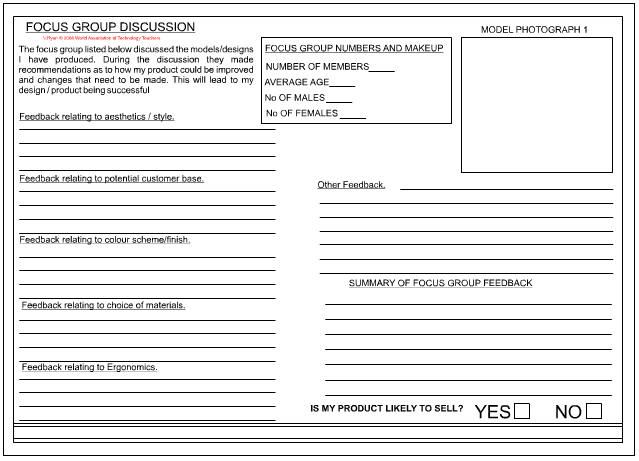 Why are focus groups regarded as important in the development of a product/design? 2. Imagine you are designing a new small LED torch. What questions/factors would you like a focus group to discuss? 3. If you were asked to gather a focus group together to discuss a new mens aftershave what mixture of people would you called to form the group? Number of Males? Number of Females? Average age and social/economic background? 4. Do you think that working alone you could develop a design as well or better than a designer who involves a Focus Group? 5. Are there some product types that do not require the services of a Focus Group when under development? If your answer is yes - name the product types and explain your answer.